Special thanks to Iggy Drougge for correcting a lot of information on this page that was incorrect concerning the components used on this card. It is a card manufactured for Novell (the Netware folks) and it is seemingly compliant to the NE2000 standard. This card uses the National Semiconductor DP8390DN chipset. It uses coaxial cable and has an AUI port as well (more on that later). Though I now realize that this is an probably an NE2000 compatible card, I've yet to find an NE2000 driver that will work with it. So far, all I have found is that Novell Netware (and the related workstation shell) have drivers that work, but that is it. Will an NE2000 Driver Work? 12/24/2002: I have obtained a version of this card with a 10BaseT (Cat5 cable) port. While it appears to be mostly similar to the coaxial adapter shown here, Windows 95 does have built in support for it. 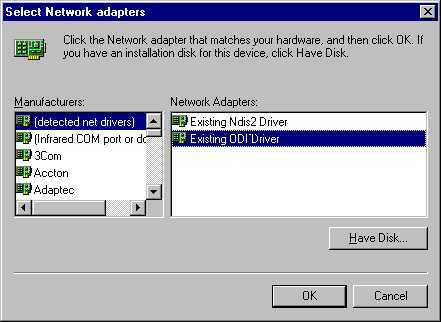 What you need: NE-2/32 (@7151) adapter for MCA, LSL.COM & NE2_32.COM files. I have them here. 1. Start your PS/2 up. Start the refdisk or ref. partition. Copy the option file (@7151.ADF) from a disk onto the refdisk or partition. Shut the computer off after doing this. 2. Disassemble your PS/2. Locate a vacant 32 bit slot and install the adapter. Power on, autoconfigure. Reboot. 3. Now--we have to set the memory range of the adapter correctly. The NE2_32.COM file will only load if the adapter is in the D0000 memory range. Start your refdisk or partition, choose to Set Configuration. Go to Change Configuration, and find the adapter's entry. Change settings as needed, press F10 to save configuration, and reboot. Load LSL and then NE2_32 from the command line (not in a DOS box!!! Bypass Windows at startup!!!) This is to confirm that your adapter is working. If you get an error, take the appropriate action as suggested by the error message. Check the memory range, and clear every other adapter out of the D0000 area! 5. Start Windows. Once Windows comes up, open Control Panel > Network. You'll have a screen similar to the following. Click the Add... button. Choose to add an adapter. Click the Add... button that appears in this new dialog. Select the "Existing ODI Driver" choice. Choose the OK button. You'll be returned to the Network control panel, which will have a new adapter installed, and some more protocols perhaps. Take this time to set up the protocol(s) you intend to use with this adapter. NOTICE: TCP/IP is not an allowed choice for this adapter!!! You can choose it, and it will appear in the Network control panel, but it will not work. I don't know why this is, but you can try everything you know. It won't work. You really only have two protocol choices: NetBEUI and IPX/SPX. Set up file and printer sharing as desired. Click the OK button in the Network control panel. 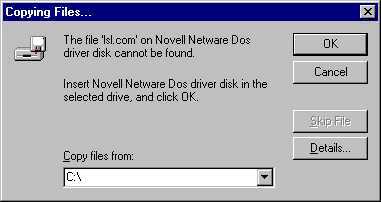 You may be asked for your Windows 98 CD, but eventually you will also be asked for a "Novell Netware Dos Drivers Disk". Simply point Windows to where you put the LSL.COM and NE2_32.COM files. 6. Listen up! Windows doesn't get the location of the LSL and NE2_32 files correct in autoexec.bat. Without those files loading, this won't work. So when you're prompted to reboot, don't. Open a text editor and check to make sure that the path to LSL and NE2_32 are correct! 7. Save the changes to the autoexec.bat file. Reboot. 8. Dismiss the Windows logo (or choose a "Command Prompt Only" once again) to verify that the drivers are loading. If all goes as planned, you'll see the results of LSL and NE2_32 loading. The next thing to watch is the Microsoft Workgroups ODI/NDIS 3 mapper. Make sure it says something to the extent of the "bound to adapter NE2_32". 9. If everything mentioned in Step 8 worked properly and there were no errors, start Windows. 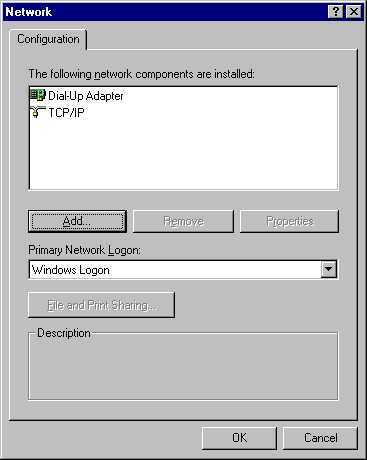 When Windows comes up, you should see a network logon prompt of some sort. The short answer is no. This is a very good adapter. Well, I had to take back what I said about the adapter being useless prior to my experiments above.. I thought this adapter was based on the National Semiconductor LANCE chipset for Ethernet. However, after posting to the comp.sys.ibm.ps2.hardware newsgroup about the Win9x setup instructions found here, I became aware of the fact that this adapter is not based on a LANCE chipset. This adapter bases on the National Semiconductor DP8390DN chipset--which seems to have features such as DMA access that actually would make this card a pretty good performer with low CPU utilization. I haven't tested that thought out though, so it could be completely wrong. But at least "from the specifications" this adapter might be better than I first thought. The short answer is no, you can't use one. This adapter does have an AUI port, but none of my AUI transceivers would function when attached to it, even after I told the adapter I was using an external transceiver.